I read an article the other day about the final Hobbit film that is due to open this Christmas: ‘The Hobbit: The battle of the five armies film to end in 45 minute battle scene‘ screamed the headline. Can you imagine that? A great war between aloof elves, socially repressed ogres, single-minded orcs, sniping goblins and smug wizards. I imagine, sat in the cinema, it will be a never-ending stream of trolling. Now, I hate to be the one to break it to Mr Jackson, but 45 minutes of watching the same boring fight over and over again is nothing compared to what Twitter’s education community is capable of. We of course only have two armies: Progressives and Traditionalists. But, even so, that doesn’t stop them from battling continuously over hallowed yet uncommon ground. Aside from being hell-bent on knocking seven shades of pedagogy out of one another, each side is resolutely unforgiving of their opponent’s fighting methods. I have often said that I don’t know what being a ‘progressive’ or a ‘traditional’ teacher actually means, and I’ll admit now that this is only half true. I do know the broad differences in ideology. Traditionalists are Victorian time travellers who know everything and believe that children should just shut-up, listen and graft silently until they bore a hole into their little wax slates. Progressives, meanwhile, mainly teach through the medium of dance, believe that there is no such thing as a single answer and that children can only work if playing in groups. The only characteristic these two types share is a fundamental belief that their opponents are singlehandedly ruining the education of this country. In terms of who is winning the battle, it’s possible that the traditionalists are at the moment. We seem to be entering an age of educational austerity. I guess that comes from a few years of a Conservative government, one secretary of state’s worryingly self-absorbed obsession with reshaping the educational landscape to suit his own ego, performance related pay and Ofsted’s demand that progress is made within twenty minutes by every child. All of this encourages weak leaders to put pressure on teachers to produce ‘results’. In this climate, rote learning, sharp discipline methods and the testing of facts in order to prove capability kind of supports a traditionalist’s approach. And with the recent Sutton Trust research project that suggests even giving praise is a waste of bloody time, you could be forgiven for being a rather smug traditionalist at the moment. The mere thought that we could make a difference by allowing children to work together, by encouraging role-play beyond a drama lesson, by bringing empathy into learning, by making lessons ‘fun’ is sheer madness isn’t it, you risk averse robotic kill-joy? However, what always strikes me as odd and depressing, as I get engulfed by the hot air caused by a Twitter-edu-debate-blast-zone, is how rigid and at times blinkered some of these progressives and traditionalists are. Maybe it’s me. Maybe I’m just a weak minded, woolly headed individual who doesn’t know his own mind. But, try as I might, I can’t nail my colours to the mast. I honestly couldn’t tell you which approach I favour because, as you have read, in my time I’ve been both a traditionalist and a progressive. I’ve worked with all types of children in all types of settings and, as I flit between being a traditionalist and a progressive, I have come to realise that there is a third type of teacher that is better than both of them put together (literally). I am talking of course about the ‘subtle’ teacher. Teaching is a subtle art and I am a subtle teacher. I am a Subtle-ist. By my Bing Dictionary definition this means that I am ‘intelligent, experienced, sensitive enough to make refined judgments and distinctions’. Therefore, I can appreciate the time or the context where a traditionalist approach is appropriate just as much as I can identify the right time and situation to deploy a more progressive mode of teaching. It is through deft deployment of these styles that allowed my pupils to make progress and, as a Head, allows me to run a school (full of bull-headed traditionalists and progressives) successfully. At the end of the day we are all educationalists, which means it is our job to educate the children in our care, which in turn means…we gots to do what works. And I’ve never known one approach work the same for everyone – and I seriously doubt you have either. So, let’s leave the extended battles to the elves, wizards and talking eagles, and let’s start an underground movement of our own: La Résistance Subtle! Let’s leave the petty name calling and ‘my way or the highway’ nonsense behind and embrace all that is nuanced in education. Let’s agree that it’s ok to change teaching styles depending on what class you’ve got or what you’re teaching, or even what the weather is like (I’ll wager a traditionalist doesn’t let the fact that it’s windy outside get in the way of a maths test). We can do it. We just need to be open to adaptation and try to approach teaching from a subtle-ist’s perspective. Have I just been taken on a wonderful journey but subtly not given any answers? I feel the wool subtly sliding over my eyes. The twitter voices have ceased to pound my head. Viva la resistance subtle. The polarised debate between progressives and traditionalists is symptomatic I think of our culture which loves binary opposites: left vs right; socialist vs capitalist; theist vs atheist; day vs night; hot vs cold and so on. As with each of these, there are variations and subtleties between the extremes and it is this vague middle ground that most of us probably inhabit. Absolutely with you ! 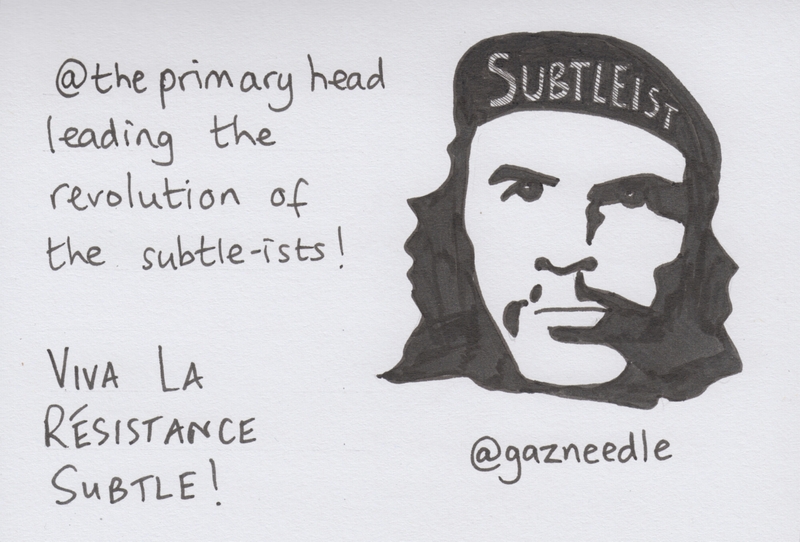 As a teaching assistant I have worked with many types of teacher and the best ones are the ‘subtle’ type.